In February 1942, Gary Cooper was handed one of his two competitive Oscar statuettes (he also would win an honorary Academy Award in 1961) for Sergeant York — a dramatization of the real-life story of Alvin C. York, the most decorated American soldier of World War I. I’ve always felt that the reason Coop was “decorated” with such a statuette was due to the movie’s enormous popularity (it was the highest grossing film of 1941) and while he gives a solid, dependable performance, I’ve always been partial to his comedic showcase from another film released that same year. In fact, it premiered in theaters 70 years ago on this date, five days before the attack on Pearl Harbor. Ball of Fire, once described by one of its screenwriters, Billy Wilder, as a “silly picture,” nevertheless features a masterful comic turn by an actor whose limited thespic abilities often disappeared through the magic of a movie screen. In Ball of Fire, Cooper plays Professor Bertram Potts, one of eight lexicographers living in a New York residence and working on an encyclopedia project funded by the daughter (Mary Field) of Daniel S. Totten, inventor of the electric toaster. Potts and his colleagues have been hard at work on their encyclopedia for nine years, and it looks as if construction will continue for another three — much to the dismay of Miss Totten, who will have to pay for the “overruns” out of her own pocket. An encounter with a garbage man (Allen Jenkins) demonstrates why there is still so much to do — the sanitation engineer’s creative use of slang demonstrates to Potts (the group’s grammarian) that his own article for the encyclopedia is hopelessly outdated, and that he will have to research the modern vernacular by visiting “the streets, the slums, the theatrical and allied professions.” He encounters several people — a newsboy, a college student, a pool hall bum — and asks for their help in preparing his treatise on slang. Later at a nightclub, Potts makes the acquaintance of Katherine “Sugarpuss” O’Shea (Barbara Stanwyck), a sultry chanteuse whom he also wants to participate in his discussions, but she is markedly cool to his proposal. 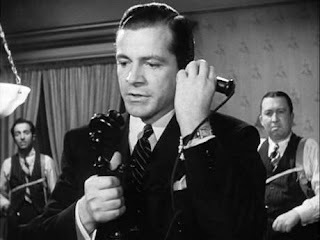 She later changes her mind and turns up at the doorstep of the encyclopedia men, but only because she has been advised by a pair of hoodlums, Duke Pastrami (Dan Duryea) and Asthma Anderson (Ralph Peters), to “take it on the lam”; both men are in the employ of mobster Joe Lilac (Dana Andrews), who’s being questioned by the district attorney about his complicity in a gangland murder, and who would like nothing better than to hear Sugarpuss’ side of the story. The professors’ think tank will provide a perfect hideout, even though O’Shea’s breezy insouciance has a disruptive influence on their daily routine, much to the chagrin of their stern housekeeper Miss Bragg (Kathleen Howard). 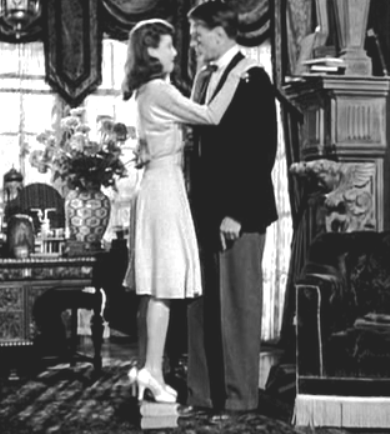 Bragg’s ultimatum to Potts that Sugarpuss leave or she will results in a confrontation between “Pottsy” and Sugarpuss — and when Potts confesses a rather strong attraction to the nightclub singer she uses that revelation to her advantage, reciprocating similar feelings and demonstrating to her would-be paramour the definition of “yum-yum” by kissing him. Potts’ infatuation goes full speed ahead to the purchase of an engagement ring and proposes to Sugarpuss — even though he’s got a rival in gangster Lilac, who entertains similar notions (mostly for convenience's sake, insuring that a wife can’t testify against her husband). When Joe learns of Potts’ intentions, he persuades Sugarpuss to play along — that way she’s guaranteed safe passage out of New York (under the watchful eye of the authorities) and can join Lilac in neighboring New Jersey, where they’ll tie the knot. A mishap with the professors’ automobile en route necessitates a stopover in a small Joisey town, where at an inn O’Shea learns (through a mix-up in bungalow door numbers) that Potts is deadly serious about his passion for her. She begins to see the bashful goof in an entirely different light, but before she can act on this, Lilac and his goons show up, spelling out the story for Potts and the other professors before collecting Sugarpuss and continuing on their way. Back home in New York, Potts is determined to put the sordid chapter behind him until it is pointed out that in returning his engagement ring, O’Shea has slipped him the rock she received from Lilac. To add insult to injury, Miss Totten arrives with her assistant Larsen (Charles Lane) to announce that due to the unfavorable newspaper publicity generated by Potts’ misadventures she is canceling the encyclopedia project — and that's interrupted by the arrival of Pastrami and Asthma, who have been ordered by Lilac to “rub out” the group unless Sugarpuss agrees to marry Joe. Elated that Sugarpuss and Joe still aren't attached, Potts and the others are able to subdue the two hit men with brains (not brawn) and ride to O’Shea’s rescue (thanks to their garbage man pal’s truck) to save her from her nasty fate. “Pottsy” and Sugarpuss will live happy ever after, thanks to his expert application of “yum-yum” as the movie concludes. Scripted by Wilder and Charles Brackett, Ball of Fire’s opening titles also credit Wilder and Thomas Monroe with the film’s “original story” — which is a teensy bit of a stretch, insomuch as Wilder cribbed the idea from the classic fairy tale of “Snow White and the Seven Dwarfs.” (Wilder got the idea while he was still living in Germany, and even when director Howard Hawks picked up on the reference Billy warned him that he wouldn’t get a shared credit.) 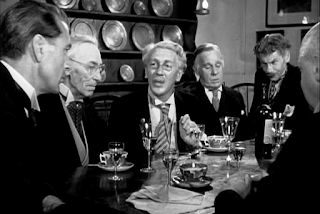 Granted, there are eight “dwarfs” as the film begins (they’re even shown marching through a NYC park as if they should be singing “Heigh Ho”) but that’s because the character of Bertram Potts is technically “Prince Charming” — so the personages of Professors Gurkakoff (Oscar Homolka), Jerome (Henry Travers), Magenbruch (S.Z “Cuddles” Sakall), Robinson (Tully Marshall), Quintana (Leonid Kinskey), Oddly (Richard Haydn) and Peagram (Aubrey Mather) fill in for Doc, Sneezy, Dopey, etc. A publicity photo of the seven character actors was even taken in front of a poster for the Disney film and the film is advertised prominently on a marquee in a scene where Cooper’s Potts talks with a wiseacre newsboy (Tommy Ryan) outside a theater. Being a Goldwyn production, the producer naturally pulled out all the stops and obtained the services of many of Hollywood’s master craftsmen (and women): Gregg Toland was cinematographer, Perry Ferguson the art director, and Edith Head designed that drop-dead gorgeous gown that Stanwyck’s Sugarpuss wears in her nightclub act. One of the highlights of Ball of Fire is Babs’ rendition (though Martha Tilton dubbed her vocals) of “Drum Boogie,” backed by Gene Krupa and his Orchestra; Gene later obliges with an encore of the number accompanied by matchbox sticks and a matchbox. 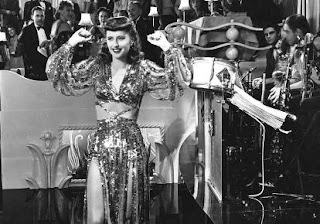 Even though Stanwyck’s voice is not her own, she’s able to reach back to her “Ruby Stevens” chorus gal days and do some impressive dance moves with those fabulous Stanwyck gams. Ball of Fire boasts a positively splendid supporting cast — particularly the vets who essay Potts’ encyclopedia colleagues, who transcend the usual stereotypes of movie intellectuals being dry as dirt by exhibiting a real playfulness (one of my favorite scenes in the film is when Potts and the “dwarves” listen to Oddly’s recollection of his marriage, which breaks out in a lovely rendition of “Genevieve”). Fire was Thrilling Days of Yesteryear fave Dan Duryea’s second feature film appearance and I like to think that if he had had a few more films under his belt, he could have played Joe Lilac (Duryea’s best bit in Fire is when he imitates Cooper’s thumb-licking-and-rubbing-it-on-the-sight tic from Sergeant York, cracking “I saw me a picture last week”) but Dana Andrews does very well in the part, supplementing the escapist comedy nature of the film with the proper menace (Andrews’ phone conversation with Cooper as Stanwyck’s “Daddy” is hysterical but it works because Dana plays it perfectly straight). I got a particular kick out of seeing a couple of other TDOY favorites in Elisha Cook, Jr. (as a waiter who tells Potts that Sugarpuss is “root, zoot and cute…and solid to boot”) and serial/B-Western stalwart Addison Richards as the D.A. determined to bring the hammer down on Lilac. In addition to Stanwyck’s acting nomination, Ball of Fire also received nods for best scoring of a dramatic (!) picture and best sound recording…with the final nomination going to Monroe and Wilder’s “original story.” It was the movie on which Wilder decided he wanted to do more behind the camera than just provide the words; his directing ambition was encouraged fully by Hawks, who allowed Billy to study and pick up some pointers during the film’s production. The movie is an odd one in Wilder’s oeuvre because it’s devoid of the frank, pungent cynicism prevalent in many of the writer-director’s works, but as Wilder himself observed: “It was a silly picture. But so were audiences in those days.” Hey…if enjoying the entertaining exhilaration that Ball of Fire provides with each passing year makes me silly, then I guess nobody’s perfect. 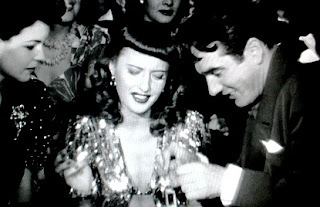 I am a Stanwyck fanatic and I agree that she was robbed in '41, but then she also was robbed in '44 for Wilder's directing debut in Double Indemnity and never got nominated for some of her fine work in early pre-Code classics such as Night Nurse or Baby Face or Frank Capra's earlier efforts The Miracle Woman and The Bitter Tea of General Yen. Babs always was good, but like Mae West, when she was bad, she was better, so I wasn't crazy when she did things such as Stella Dallas, but when she was despicable even in later films such as Forty Guns, The Violent Men or the campy Walk on the Wild Side...oh man. Have to give the Academy a little credit in 1941 for at least nominating her for the right role instead of The Lady Eve or especially Meet John Doe. Edward, I very much enjoyed your post about BALL OF FIRE and its behind-the-scenes info. I had read about it, but never had an opportunity to see it. Now more than ever, I'm looking forward to sitting down and watching it! I love Ball of Fire too, Dorian, but the credit should go to Ivan. He wrote this great piece on that fun film.